FARM FRESH: MegaFood’s Complex C is made with FoodState’s Farm Fresh Fruit Phenolic blend which delivers a broad spectrum of age-defying antioxidants from colorful whole foods. 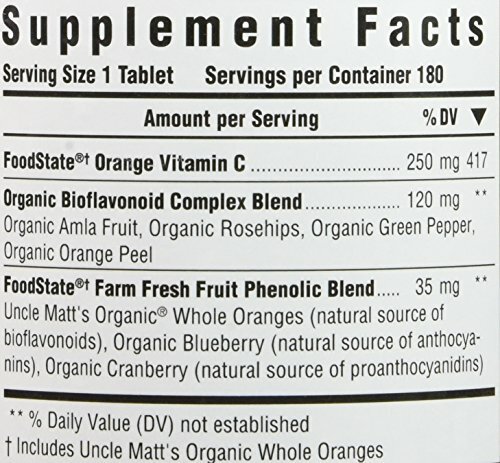 OVERALL HEALTH: FoodState vitamin C provides an array of immune-supportive compounds for life and organic bioflavonoid complex promotes cell and tissue health. 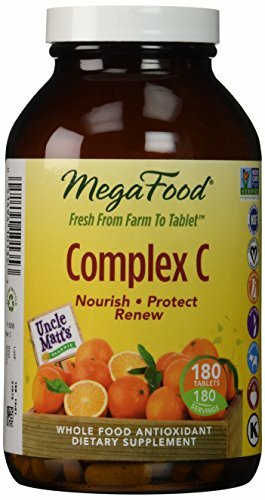 MegaFood Complex C is a powerful antioxidant formula that delivers vitamin C and a full spectrum of immune-supportive and protective phytonutrients naturally found in whole oranges. Vitamin C is very important for various functions, from supporting healthy tissues and gums to helping white blood cells give protection to the body and care for immune function. Including Complex C in your diet is especially important to help care for optimal health right through periods of stress and cold and flu season. MegaFood has received the Non-GMO Project Verified seal from the Non-GMO Project. The Non-GMO Project is a third party certification program that assures a product has been produced according to consensus-based best practices for GMO (genetically modified organism) avoidance. THE SLO-FOOD PROCESS: We mill, puree, and optimize nutrient content, then dehydrate our ingredients with the utmost care in our unique Slo-food Process, making the most efficient products for your health. GENTLE+EASY TO DIGEST: FoodState Nutrients are made with whole foods to provide essential vitamins and minerals that are easy-to-digest and gentle on the body, even when taken on an empty stomach. You are not limited to when you’ll be able to integrate MegaFood into your day. QUALITY MARKED, FARM TO TABLET: Since 1973, MegaFood has been committed to making products that use real food from family-owned farms to make a real difference. We partner with a team of scientists at the University of New Hampshire to identify which fresh whole foods are the most efficient to deliver vitamins and minerals at the same time as ensuring the freshness of the foods we start with is delivered in each and every tablet we make.